Yesterday evening my man was jubilant! Many of you know that we are a great Rugby family. Most of our men have played rugby and our grandson has followed suit. 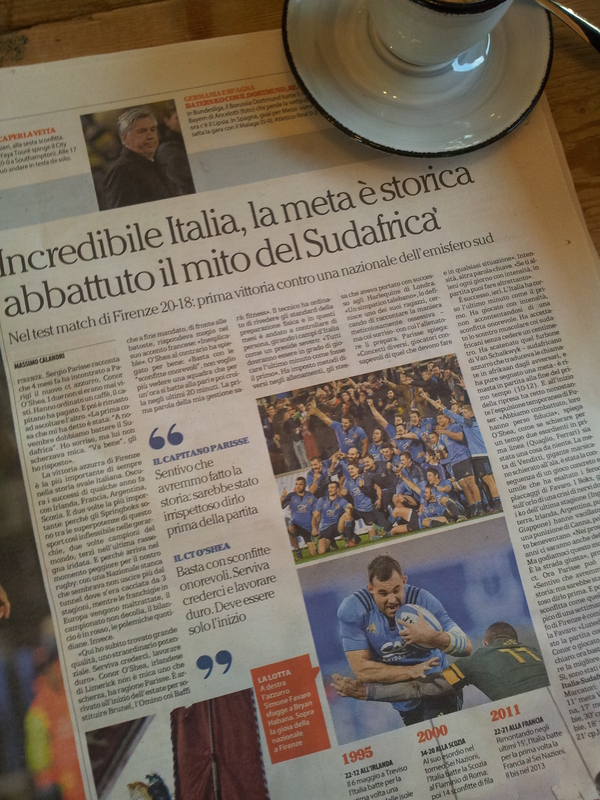 Why was my man so happy, well Italy had just beaten South Africa, a very strong team, 20-18. So, Italy goes from strength to strength and considering Rugby is not the country’s first sport, which is football (Calcio), this is very pleasing indeed. The new coach, Conor O’Shea, seems to be making a big difference and confidence is high. 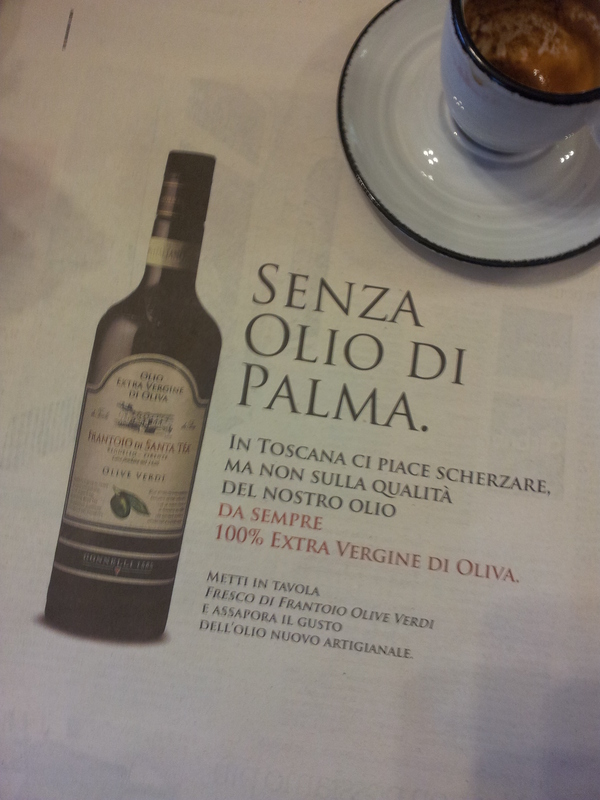 Extra Virgin Olive Oil senza (without) palm oil. 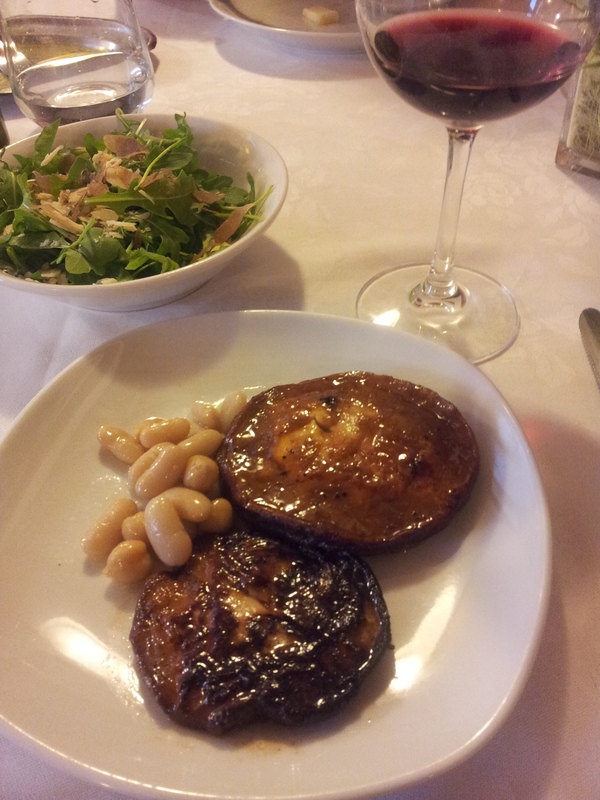 Anyway, what about things closer to home in our little bit of Tuscany? 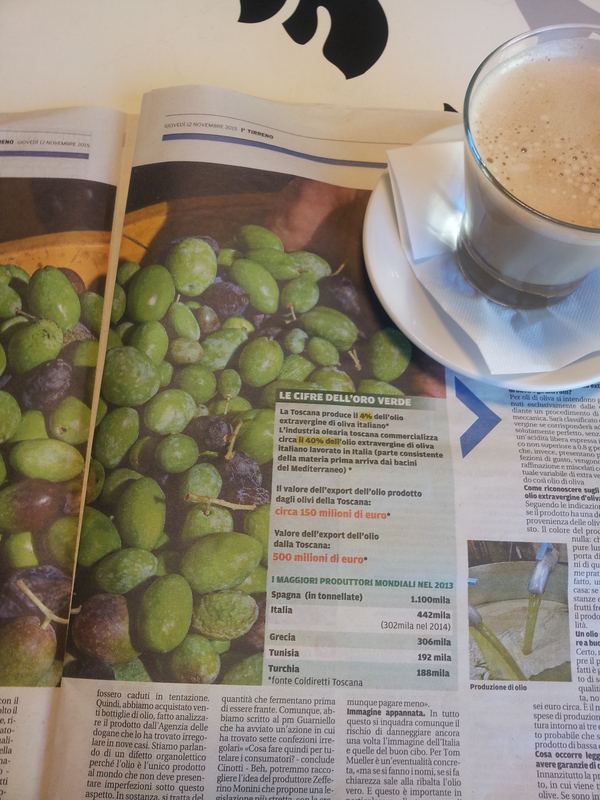 The subject of pure Extra Virgin Olive Oil is on everyone’s lips in the caffè bar. Are you aware that this beautiful nectar is being sold around the world, some claiming that it is pure when in fact it is ‘watered down’ by palm oil! Now, this should be shown on the label, so read the very small print and make sure you get the real stuff. You can always come to Tuscany and buy fresh from the producers if you fancy a little break! Carlo and son Simone behind a pile of lovely panettone at Bar/pasticeria Fiorentino in Montespertoli. La Nazione. 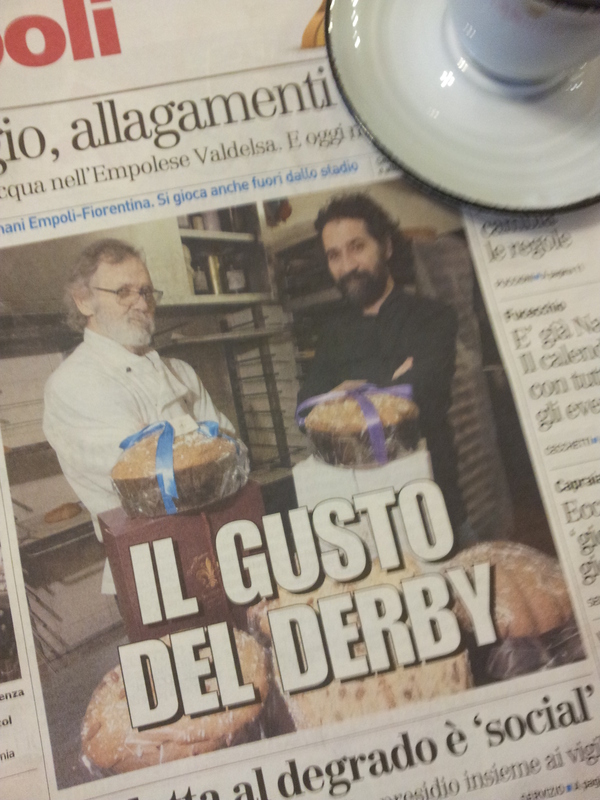 Meanwhile, and in the run-up to Christmas, our part of Tuscany has been running a Panettone making contest, and we were really pleased to read in the paper yesterday that our good friends at Bar Fiorentino in Montespertoli have won the accolade! This ‘Derby Del Gusto’ is a popular event each year and my man always takes two of the fig and walnut versions to England for friends and associates. 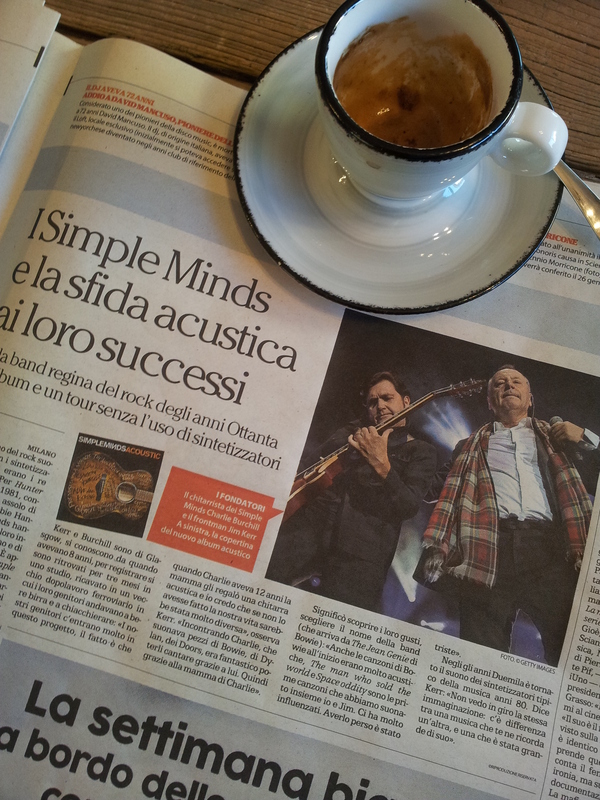 Simple Minds in Tuscany. La Repubblica. And, not to forget for all you rockers like me, touring bands this week have included Simple Minds and Aerosmith. Oh, and for all the teeny boppers we are also currently hosting Justin Bieber. I just popped off to check out Simple Minds on YouTube and there’s some great stuff there. You may remember their number one hit ‘Don’t you (forget about me)’ in 1985. The Scottish band was heavily influenced by Roxy Music. Now Brian Ferry I can watch him perform anytime! Aerosmith? Well they are just brilliant in my mind, but tickets seem to be sold out the minute we hear about these bands; hey ho. OK, time to go, cooking lunch at home today (Sunday) as two-thirds of the local restaurants are closed for winter holidays. Have a great week and do drop me a line. I love to hear from you! Hurrah! September is here with its cooler weather and a little rain! After a seriously hot humid August, it was a relief when we hit the 1st September. And, on this day the first mechanical grape picker started trundling through the vineyards below our house, collecting all those plump purple grapes that will provide us with our next supply of Chianti wines. Also on this day, the shooters were allowed to start banging away at first light, celebrating the start of the hunting season. I make no comment on this except that we would be happy for local wildlife to take up arms and fire back. Oops, sorry, that was supposed to be no comment. Anyway, What else to celebrate? Ah well, the seasonal fruit; we are gorging on lovely fresh fruit salads for breakfast every morning. Peaches, plums, apples and some imported things like bananas and kiwi. 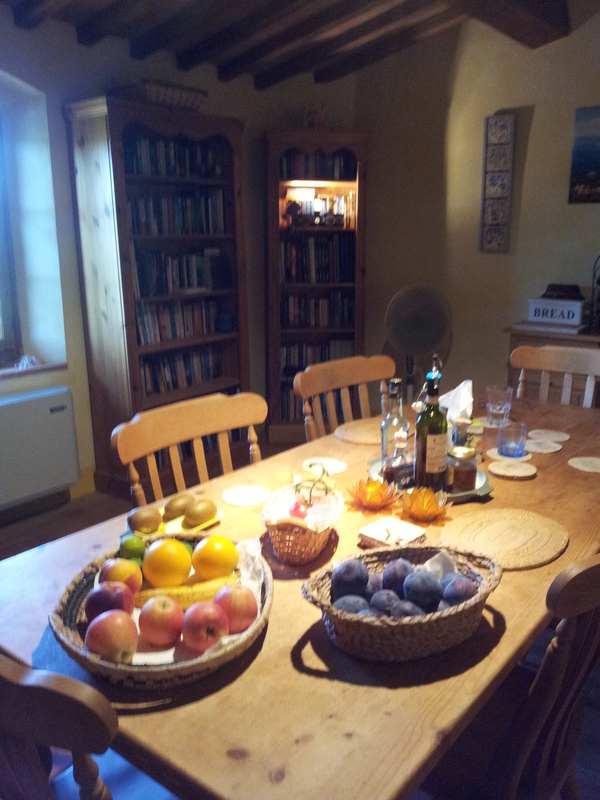 So I thought you might like a picture of my big kitchen table with its baskets of fruit. 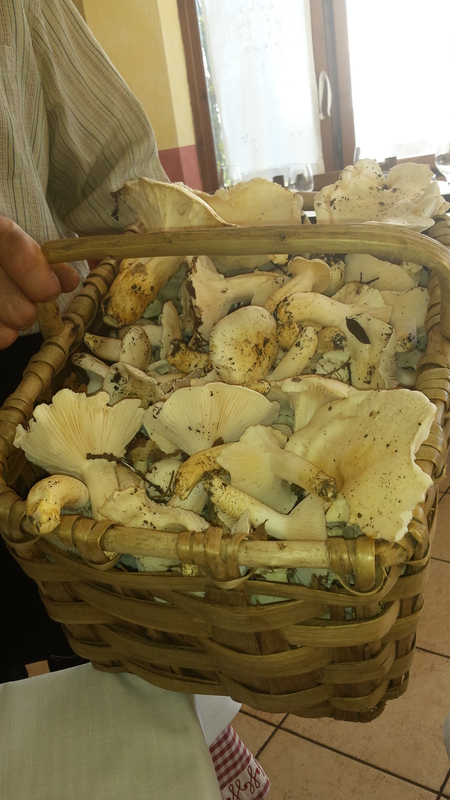 The other things I adore at this time of year is the fungi harvest. 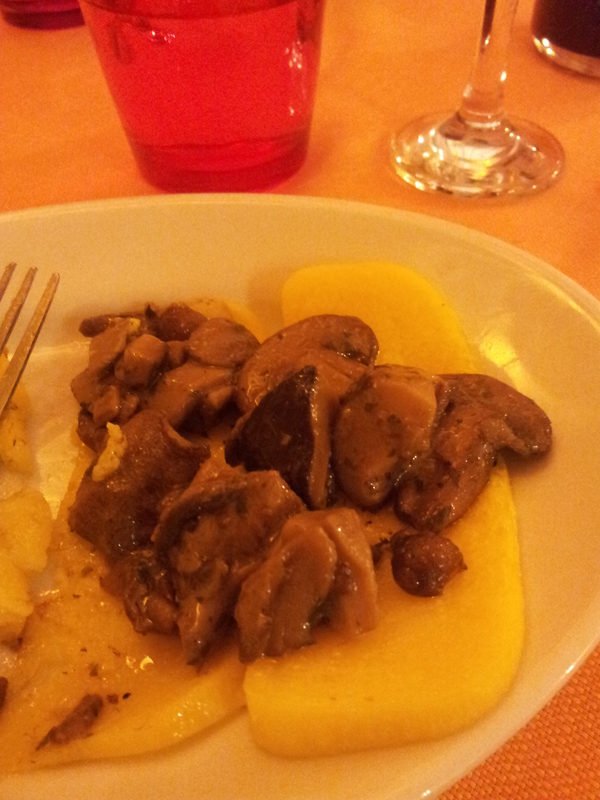 In particular the big porcini mushrooms that are delicious grilled whole as an anti-pasti. Yummy! Autumn fashions from Simona Barbieri. 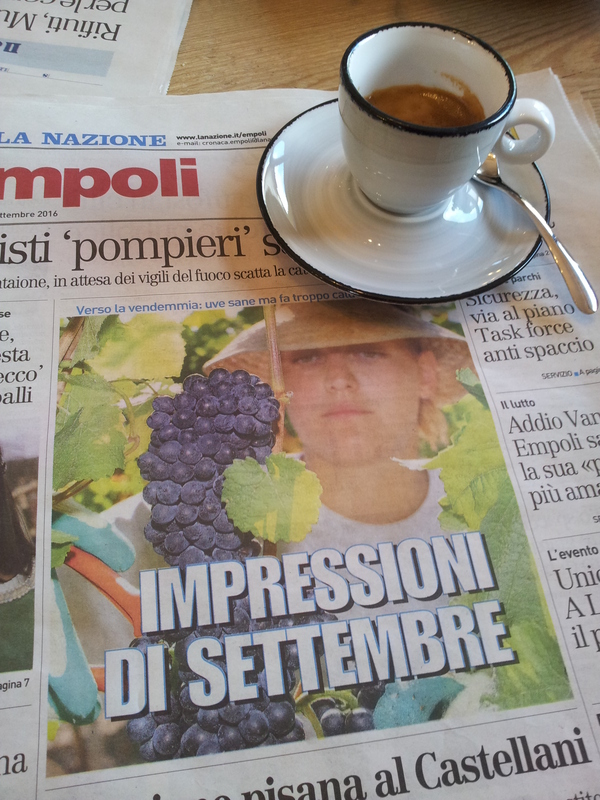 Now most of you will already know that I love clothes and the Italian Autumn fashions are fabulous. In particular, the oranges and browns that really suit my colouring. Whilst I hate to give up wearing flip-flops, stylish ones of course, I do adore window shopping for handbags and shoes. My poor man cannot understand why I keep buying handbags, “You can only use one at a time and you keep most of them in a cupboard for months.” But that’s not the point, is it girlies? Anyway, that’s enough for now. Do send me your own September stories either by replying to this blog or by email to june.finnigan@virgin.net. I love to hear from you. PS I’m still on target with my latest book, rattling away at least one thousand words a day! I’ve just got to a very scary bit! 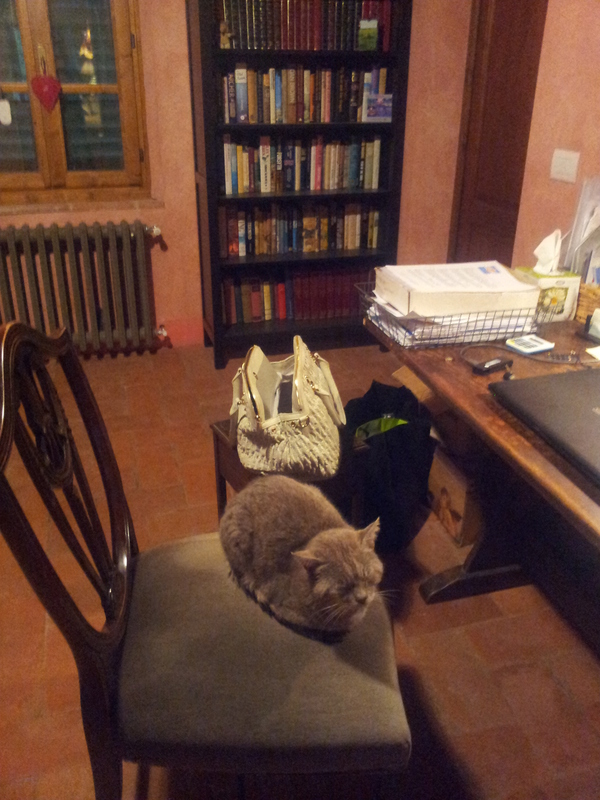 Porcupines, An Earthquake, Studio Cat, Spooky Coffee, Pooh, Fungi and Silvio in Hospital in Beautiful Tuscany. “I wouldn’t start from here, If I were you, and by the way I found this in the garden!” The start point my man was referring to was the beginning of my blog and the thing he found in the garden was a porcupine quill. Now our still new garden is very well fenced and has so far kept out the deer and cinghale (wild boar), but low slung animals still seem to get inside. We have only ever seen a porcupine once crossing the road, safely I hasten to add, and after dark. But back to the blog and I always ask my man to do a quick edit. He quite rightly suggested I start somewhere else, rather than begin by mentioning that he had returned from a business trip to London on Friday feeling exhausted; so I won’t mention that. Then to change the subject I told him about the earthquake, which happened when he was away. I had spread a load of work out on the kitchen table and when the tremor started I had to hold on to it to steady myself. Fortunately, my glass of wine only shivered slightly and quickly settled down again! Has anyone else experienced an earthquake? Do let me know. Farty Barty waiting patiently for my return to the studio. We have recently had a new internet connection installed and so working on-line has become so much easier. I can definitely recommend AirWiFi to all those struggling to fund a decent internet connection in this part of the world. Thank you to friends Karin and Hans for suggesting it. Go to http://www.airwifi.it However, with a cat on one’s lap, who is needing comfort from the nasty thunder outside, it’s not so easy to reach the computer and go on-line! Everytime I get up he’s back on the chair waiting for my return and I’m too soft to send him away! 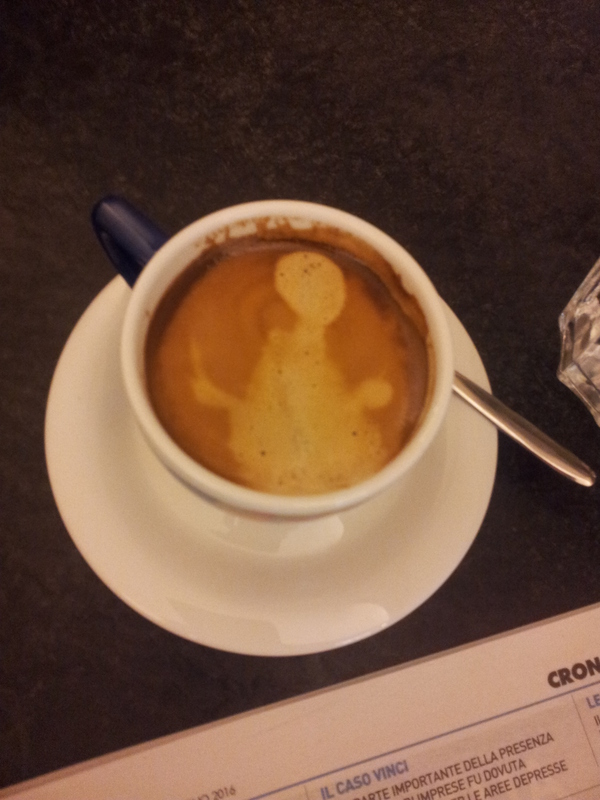 Seeing spooks and aliens in my morning coffee! Hurrah, we have a winner for my signed book and she is blog follower Odette, who spotted that my coffee had changed to a small black, whereas in previous fotos I always had a white one! Brava that lady! 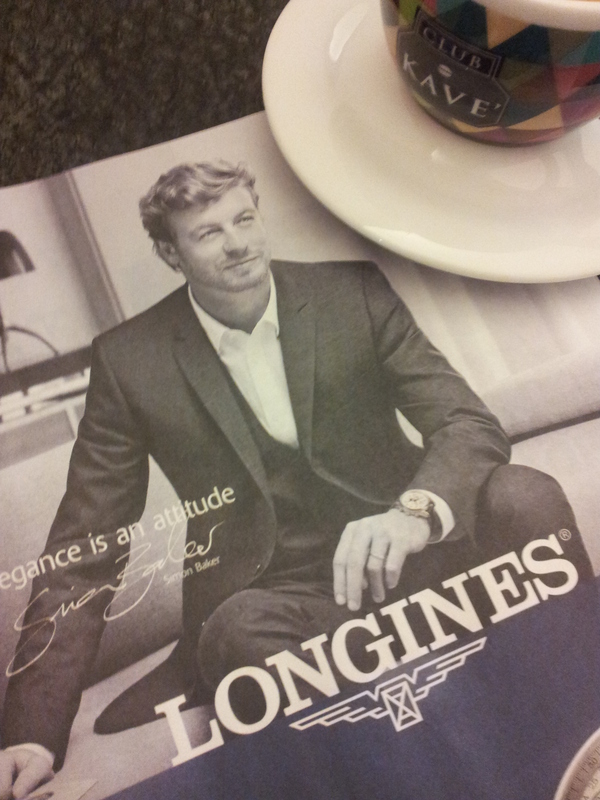 So why had my coffee changed? Well down in Certaldo I had been trying different ways of drinking espresso as I believe the milk is not too good for me. 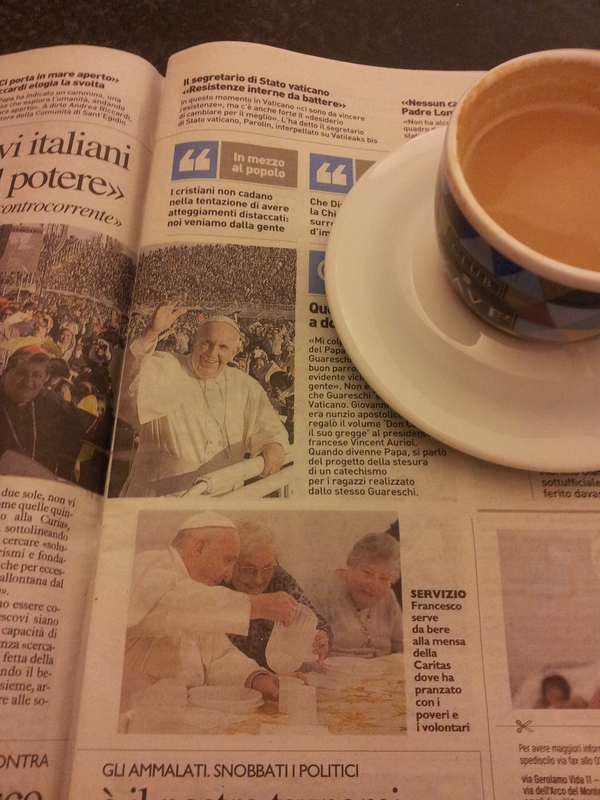 This is very sad because I love my morning caffè latte, it just no longer seems to like me! This has been very confusing for Caffe Bar Il Solferino, where they know all their customers and what they drink. So finally, I have selected caffè latte with soya milk, it has the same creamy texture but I am having to acquire the Italian liking for sweetness! Ok, at this time of year, as many of you know, we are gearing up for The Rock Chick Band’s annual concert garden party and we already have one rehearsal under our belts. 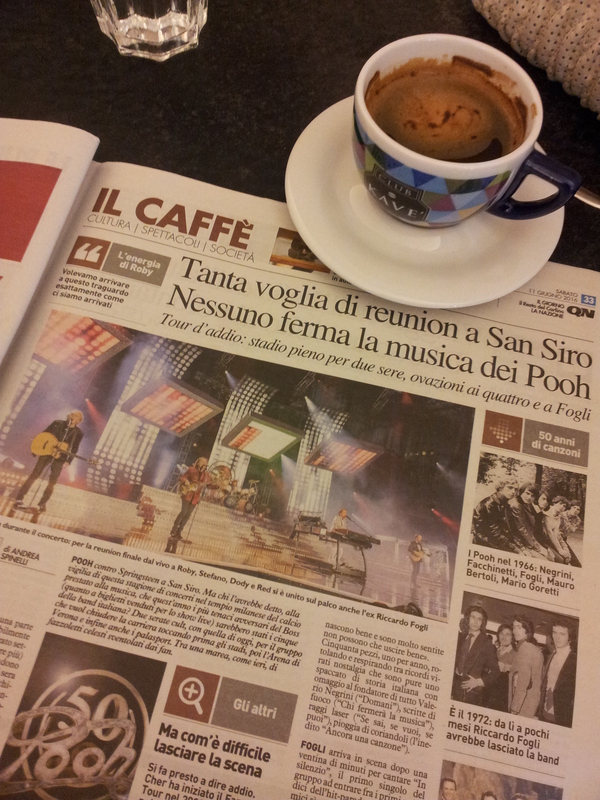 I read in the paper that the original line-up of the rock band known as POOH is touring again. They were very popular in Italy in the 60’s and 70’s and in the rest of the world I’m told! 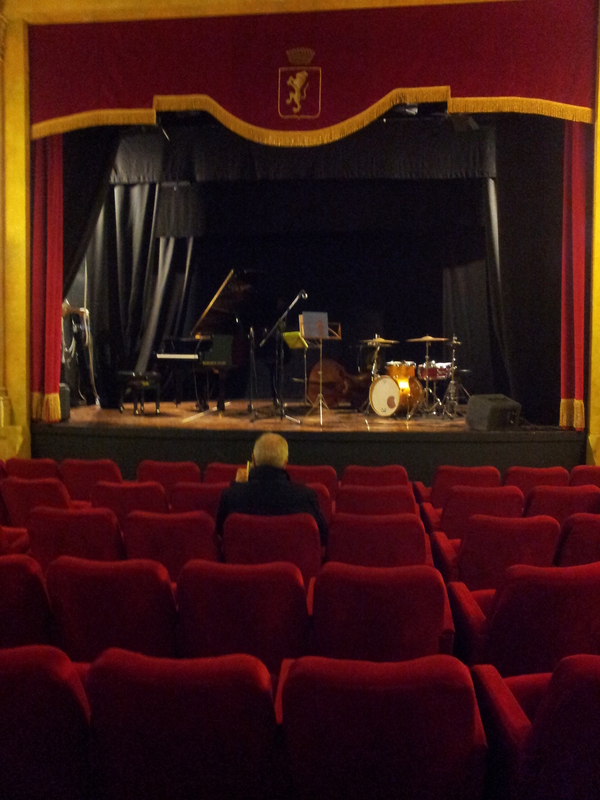 It’s a great time for the aging rockers of this world, particularly in Italy where the concerts are always sold out! 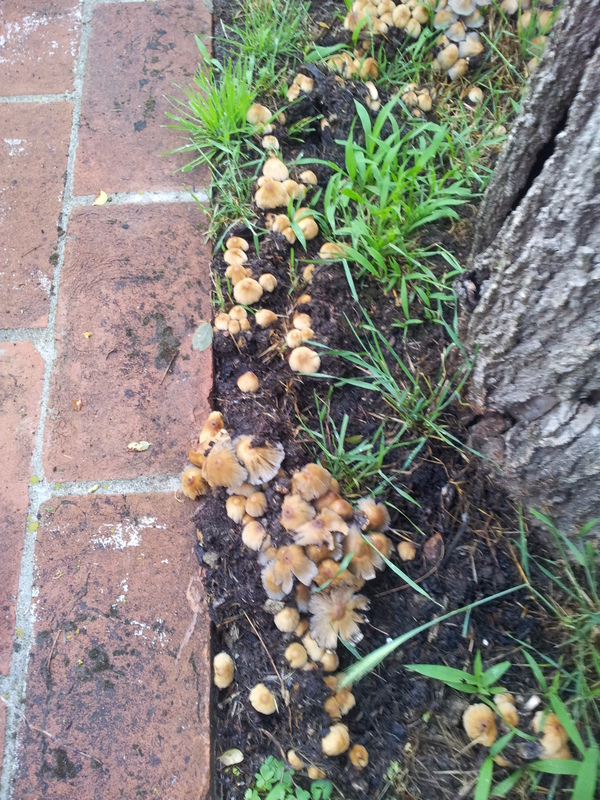 Fungi in the garden. anyone know what it is? Meanwhile, back in our lovely wooded garden, the deluge of rain has bought lots of interesting fungi to the surface. If any of you clever clogs know the name of these, do let me know. Finally, we are all very sad to hear that Silvio Berlusconi has been committed to hospital with heart problems and is to be operated on today (Tuesday). It sounds quite serious and is a four-hour job! There is already talk of finding a replacement leader for Forza Italia, Silvio’s political party. 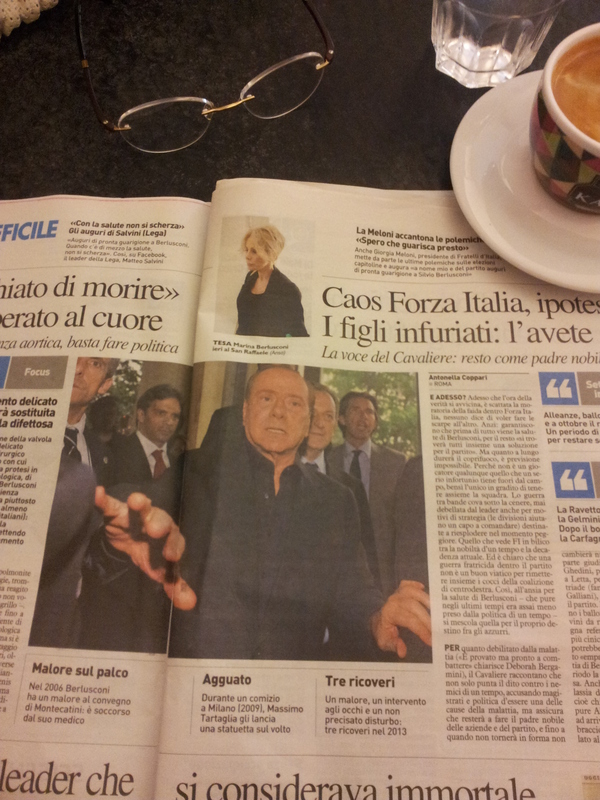 But let’s hope that all goes well for him; Italian politics will lose a lot of colour if Silvio steps down. Well, enough of that, must organise some lunch, do voice exercises whilst its cooking and pour myself a nice chilled white to assist my singing practice. 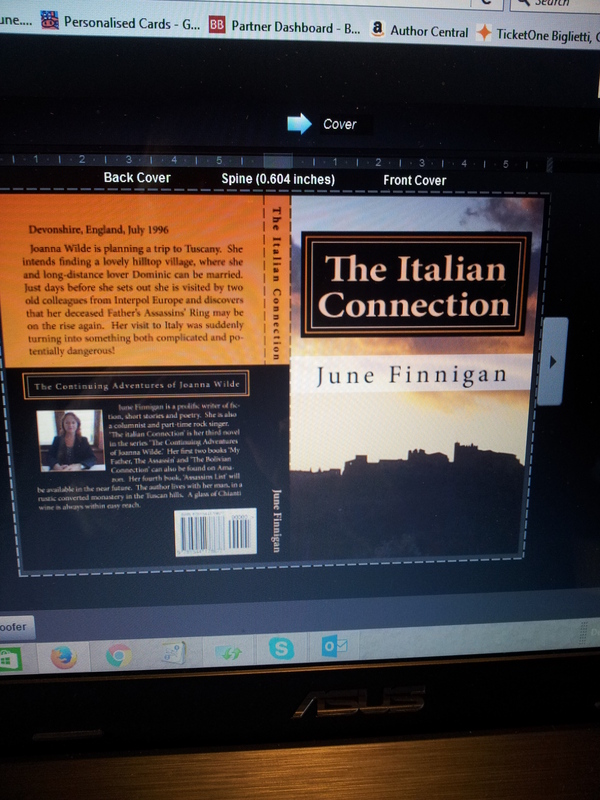 My man is currently occupied in his own studio, with a Skype call to England, so I had best not disturb him! 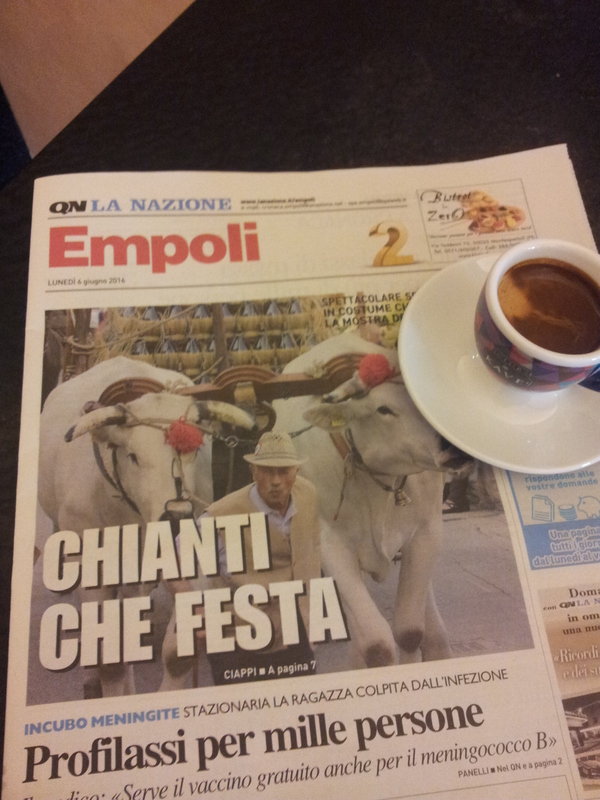 The traditional Bullocks arrive with the first of the ‘new’ Chianti Wine. La Nazione. Now this is the time of year when the nearby small town of Montespertoli has an exhibition of Chianti Wine in its central Piazza and it’s a lovely setting amongst the trees and flower beds. The piazza is surrounded by white tents and a couple of hundred local vineyards bring their Chianti wine for lucky people to taste. The traditional start to the festa involves two bullocks hauling the first of the ‘new’ wines into town. Then the festa goes on for a whole week and with it comes the annual ‘Bomba Acqua’ meaning a deluge of heavy rain to send everyone scurrying into the local bars. Also during this period of Bomba Acqua, the first of the May wedding parties arrived from England and other parts of northern Europe. Tuscany is very popular for tying the knot due to its many castles and historical villas. We met four lovely people, one couple from America and one from Wales, who had arrived for an English wedding celebration and sadly could not see the swimming pool at their B&B, due to the fog and rain! We hope you nice people enjoyed the wedding despite the weather! 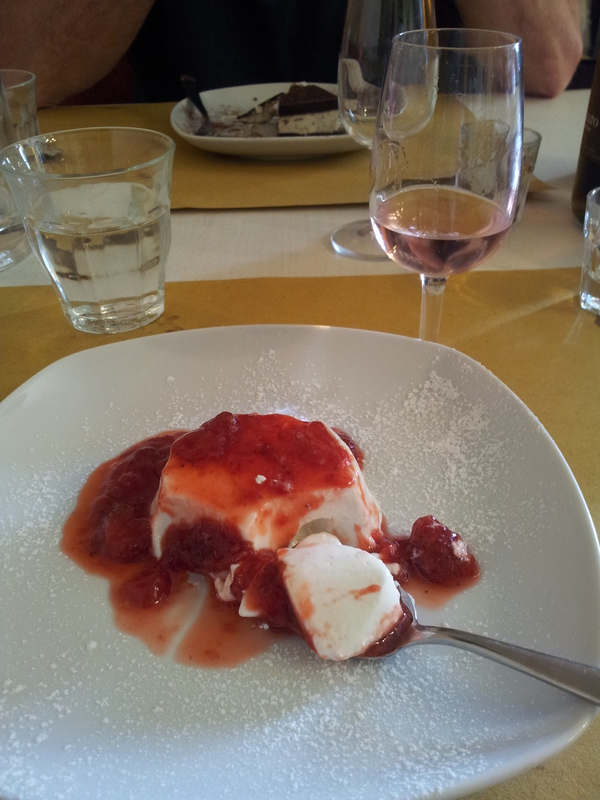 Rosolio alla Rosa and panacotta. I’m sure you will agree that the best way to relax during unreliable weather, is to repair to a good local restaurant for a long lunch. We tend to do this on Sundays anyway, and once again returned to L’Osteria Casa Chianti, which is just ten minutes away. I was not presented with a rose this time but, even better, a bottle of Rosolio alla Rosa Digestivo with my panacotta desert. 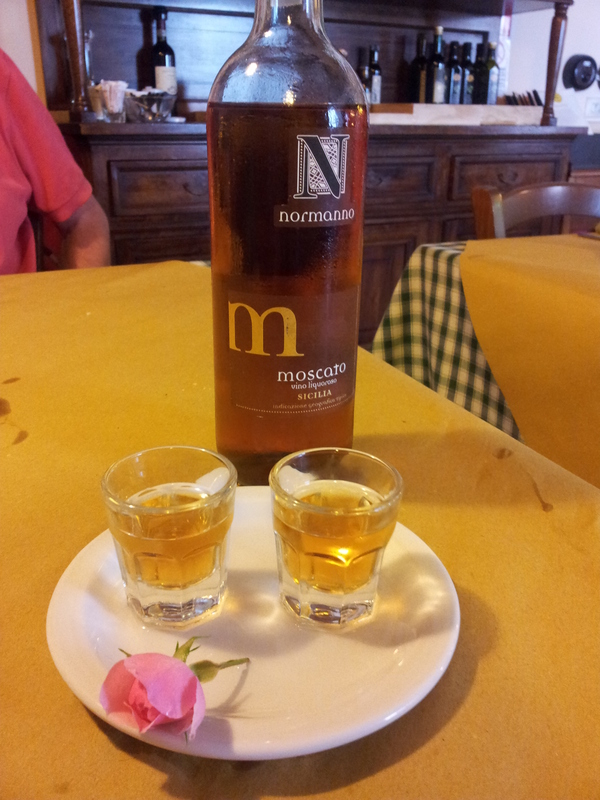 It was really delicious, tastes and smells like English Roses and can be bought locally near Barbarino Val D’Elsa! 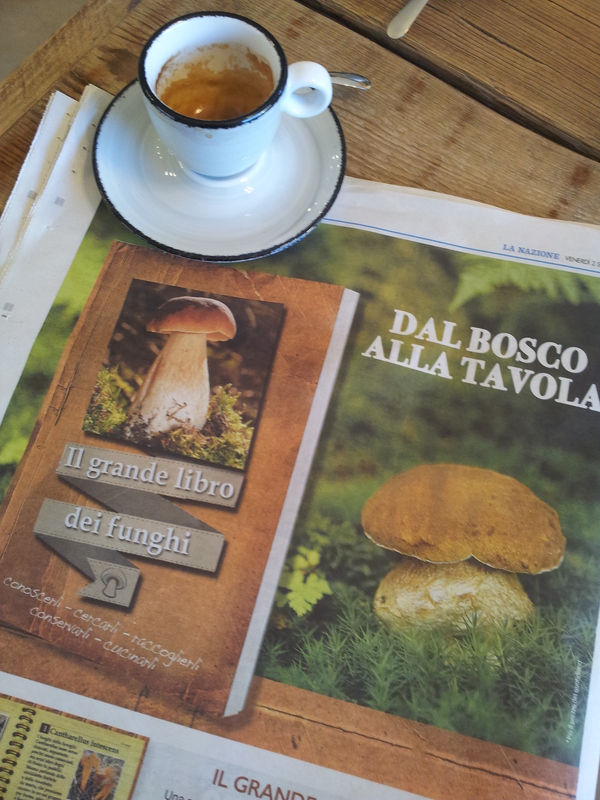 In fact the restaurant sources everything locally and in particular the tartufi (truffles). Yummy. 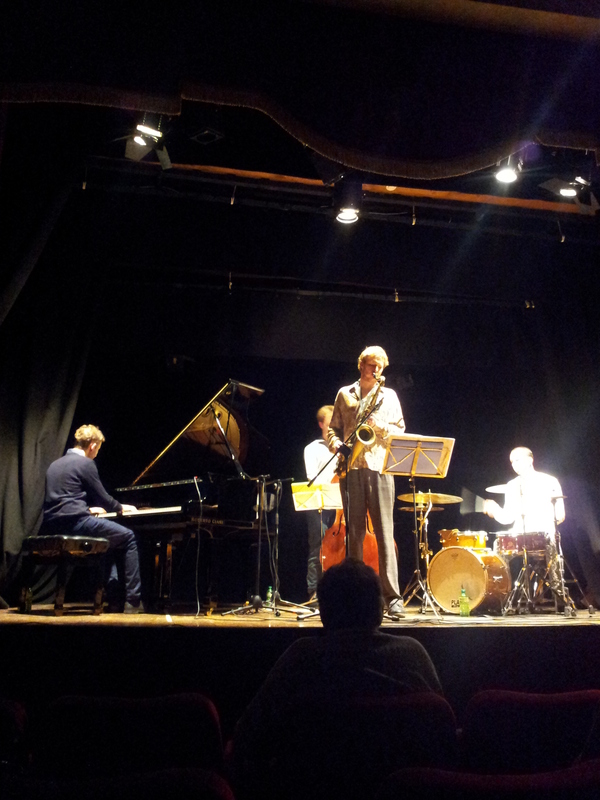 I should mention at this point that the place was packed, so you should ring and book a table if you intend going! 0039 0571 669 688. The 70th anniversary of the end of World War Two. La Nazione. Lest we forget, last Thursday was the 70th anniversary of the end of World War Two. 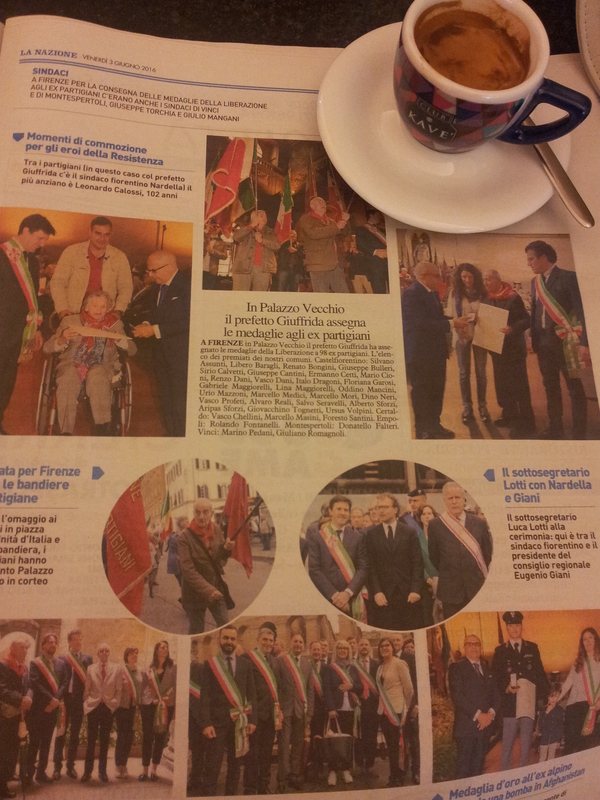 We saw marches waving the old Partisan Red Flag, remember in Italy it was the Communists vs Fascists, and some of the old remaining partisan members of the Resitenza were presented with memorial certificates. I always find these occasions very emotional and it is hard to imagine living in this beautiful country when it was overrun by Fascists and Nazis. Yes, I’m back with a wag in my tail and feeling full of the joys of early summer in Tuscany, despite the news from Florence that the road beside the Arno, and close to the medieval Ponte Vecchio bridge, had collapsed. Be careful where you park! 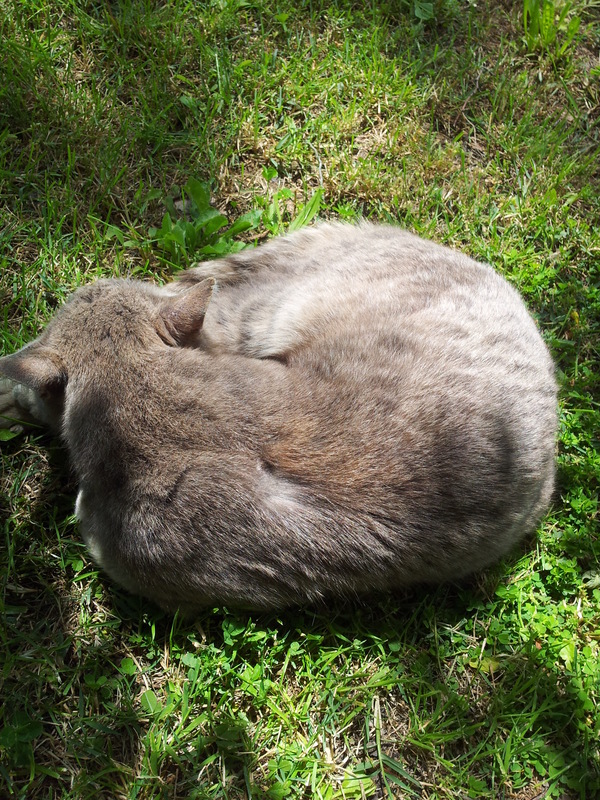 Farty Barty curled up at my feet under the Oak Tree. Now, many of you have asked about Farty Barty the cat and you will be very pleased to know that he has finally settled into his and our new home. As for ourselves, we are feeling even more content having got some of our well-travelled pictures on the walls. The house, trees, garden and surrounding countryside are so very therapeutic and I foresee great novels being written here! 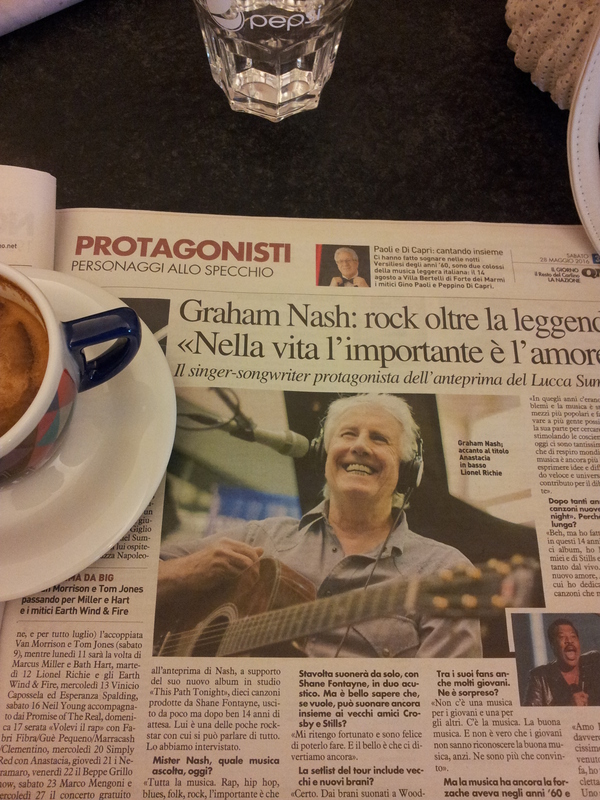 Graham Nash in Lucca, great singer and songwriter. Back in the world of rock music it is less than a month away from our next Rock Chick Band concert and our first rehearsal will be this coming Saturday. There is no need to smoke and take drugs to be a rock singer; believe me, I get a high immediately I am behind that microphone! Meanwhile, the Duran Duran tour hits Florence on 10th June and they will already be sold out. No, I am not going, I did that twice in the ’80’s with my beautiful daughter. However, I will be singing one of their songs at my own concert; there are just a few of DD’s that I really like and this one is called Skin Divers. Lucca, near Pisa, is also a very popular venue for concerts and the aging rocker Graham Nash is currently here in concert. A great song writer too and I would have loved to have been there, but time is currently of the essence. Complimentary Moscato and rose at L’osteria Casa Chianti. 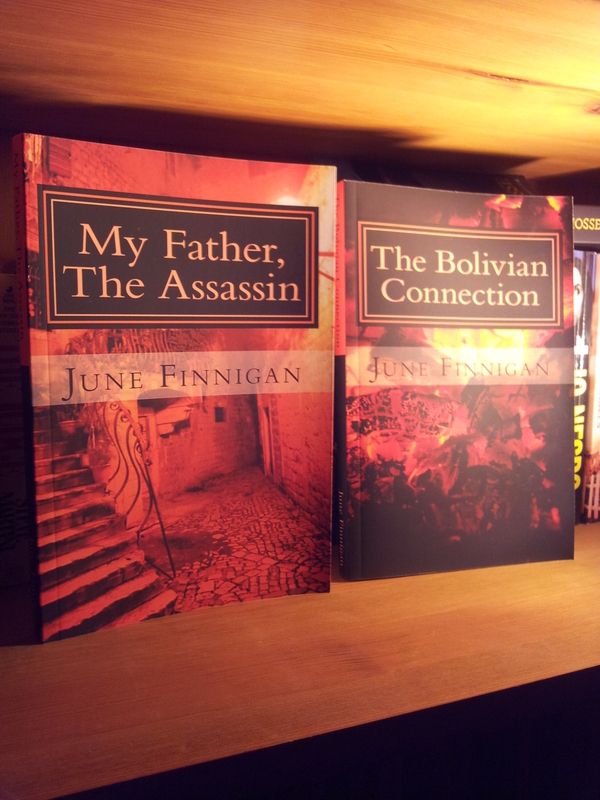 foto J Finnigan. Silvio is honoured with a special Pizza in Napoli. 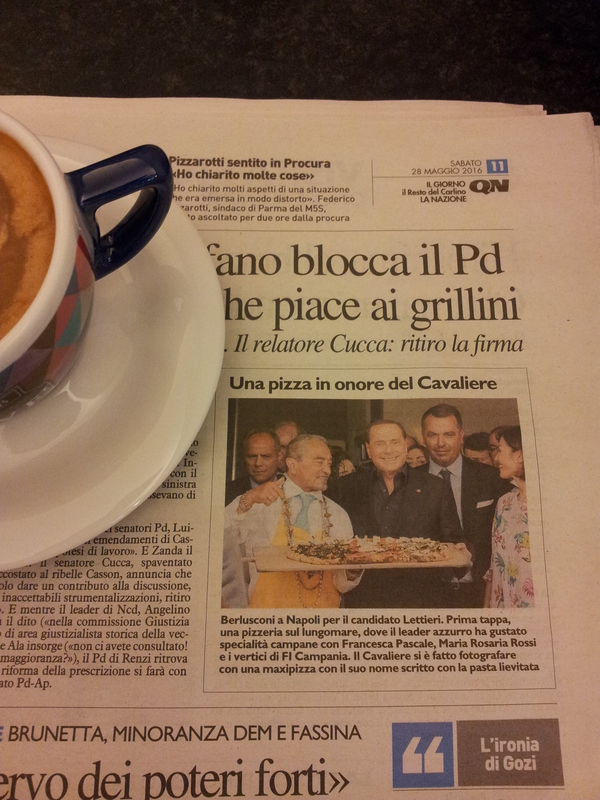 Oh yes, I know you like to hear about our Silvio so here is a little snippet from our national paper. Down in Napoli, Il Cavaliere, also known as Silvio Berlusconi, was spotted being presented with a Pizza made in his honour. It was a long pizza with a ‘mare’ flavour, that is ‘flavour of the sea’. He is hugely popular down south and it’s only a matter of time before he’s back in the chair, or so they say! I’ll keep you posted.